in this summer stir fry. Chopped cashew nuts or sesame seed if desired. Cut the skinned pineapple in half and wrap one half in plastic wrap or foil to store in the fridge for later use. Cut the remaining half into two pieces lengthwise and cut out and discard the core. Cut the pineapple lengthwise and then crosswise into bite-sized chunks. Heat vegetable oil in wok or deep frying pan and add onions and green beans, stir frying until onions begin to look translucent. Ad grated ginger, soy sauce, oyster sauce, honey and rice wine vinegar. Add pineapple, cover and cook for a few minutes - until green beans are tender but still bright green. Add shrimp, pepper and red pepper flakes if desired. If desired, sprinkle with nuts or sesame seed and serve over rice. That really looks delicious, Bev! I'm not a big fan of shrimps, but this looks delicious. I can try! Made this for dinner tonite and it is soooo good!! That looks amazing Bev! 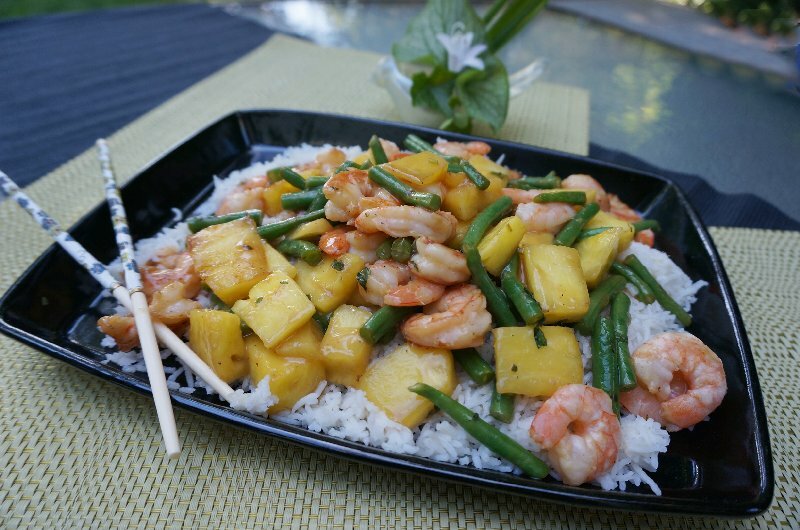 Love stirfrys .... especially when they have shrimp!